FORGET Microsoft, Boeing, KFC, Coca-Cola, General Motors, Nike and Philip Morris. All Johnny-come-latelies and also-rans. And while George Lucas deserves some credit for turning his silly Star Wars into a multi-billion-dollar franchise - covering every-thing from video games to action figures - he's the rankest of amateurs when compared with the greatest entrepreneur in history. Ladies and gentlemen, a big round of applause for the founder of the very first and still the mightiest of all global corporations: St Peter, first CEO of the Roman Catholic Church. This brings us back to George Lucas and his Star Wars action figures. Once again, we’re looking at knock-offs from the Catholic original. The church has been marketing its superhero for millennia, with action figures in every church, and a wide range of other goodies – rosaries, candles, Virgin Mary statues, miracles, St Christopher medals. Wow. What a genius, coming up with such a clever metaphor all on his own. I suppose I ought to explain why Phil's analogy is poor. Well, Yoda could lift an X-Wing out of a murky swamp with no hands and his eyes closed, and don't get me started on how badass Darth Vader's "force grip" is. Though Jesus is cool and all, what with his water into wine power, he's not comparable (he doesn't even come with a light-sabre). For an atheist, Adams is more obsessed with religion than most of the religious people I know. And if you are going to have a go at religions, I'd say there are more worthy targets than the Catholic Church. Most Catholics are fellow lefties for crying out loud Phil! 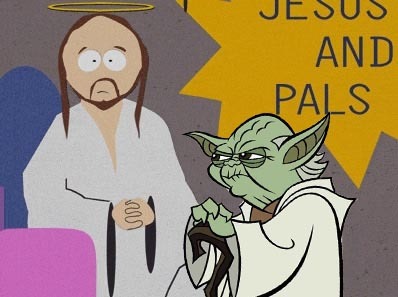 Update - Yoda and Jesus would have been best mates. Technorati Tagged - Fallacy, Skepticism, Impugning Motives, False Analogy.